Some of the Linux flavor may not come with nmap installed, so you can install it using yum or apt-get depending on the operating system you are using. Ping sweep is generally used to find out which hosts are alive in the network. Ping sweep can be used if you want to scan large number of hosts in a network. The above command will scan all 65535 ports of a given IP address. Nmap command relies on different methods to detect operating system and service information. The aggressive service detection is helpful when the service runs on an uncommon port (for e.g, SSH is expected to listen on port 22, but the remote host might be running the service on different port). The aggressive service detection is slower than the normal service detection, as the later one gets the information from the service banners. The above service detection example will reveal the operating system information. It’s also possible to guess the operating system and its version using the below command as well. Note: The OS detection requires root privilege. TCP/IP fingerprinting (for OS scan) requires root privileges. nmap allows one to identify the list of sub-domains for a given host. Identifying sub-domains of a hosts can reveal new targets while performing security assessment. To do that, dns-brute.nse script has to be used. The given domain name may host multiple websites using virtual hosts feature of the web servers. You can identify virtual hosts using hostmap-bfk.nse script. From the above output, you can copy the script name and use it with –script option. The above command will scan 2000 common TCP and UDP ports. 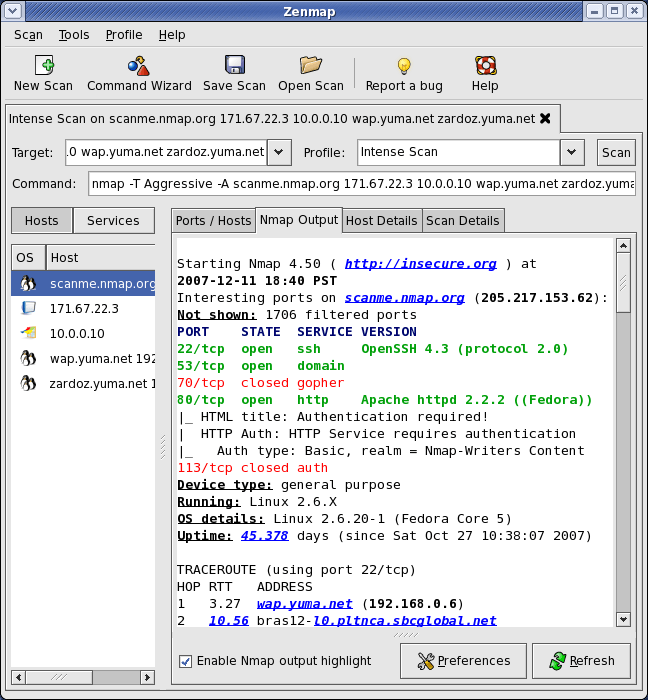 The –PN option requests nmap to skip ping scan and assume that the host is up. The option is useful when the remote machine has firewall enabled and drops all ICMP packets. The above command requests the OS to establish TCP connection to the 1000 common ports instead of sending TCP SYN packet. All the above example commands were scanning an IPv4 address, but you can scan IPv6 address as well. To do that, you need to use option ‘-6‘ followed by an IPv6 address.